50% of total accomodatin cost is charged in case of no show. 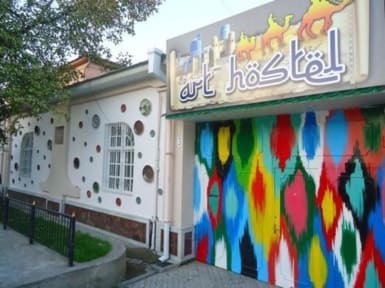 One of the best hostel I stayed at in Uzbekistan. To find cash machines that accepts MasterCard is very difficult in Uzbekistan but this hostel accepts credit cards. 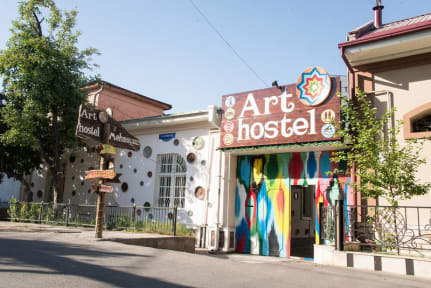 The best hostel I’ve stayed at in all of Central Asia. This hostel would get 11 out of 10 if I could. Ok, so it’s 110% recommended. Very good location near to metro and bank to exchange money. the breakfast is amazing. You almost can skip breakfast if after you had the breakfast. Toilet is clean and they have a common area for hangout. Great place to stay, very good facilities, location is also OK, wonderful and really helpful staff, good breakfast. Highly recommended! Art Hostel is very friendly, with a relaxed atmosphere. They are really accomodating and helpful. Lots of info on what to see and how to get there. Fast internet and comfy shared space. Nice swimming pool for cooling off during the day. Wished I could have stayed longer! Lovely hostel, friendly receptionist and comfortable beds (not bunks). Located about 10 mins walk from metro station. Breakfast was fantastic! Only a couple of things could have been improved - just one bathroom with shower and toilet meant there was sometimes waiting around for others to finish. Also the heating in the bathroom and bedroom were up far too high. I didn’t get to experience it much, but it was a pretty hostel, very clean and conveniently located. Don’t miss the pool! Great place, but condescending and not very helpful staff.